Seems I frequently am making excuses for why I haven't blogged in this many days or why I have been absent from the blogosphere for that many days. Well, here comes another one. I haven't been here lately because I've been in the laundry room. Not really doing that much laundry actually, but metaphorically, I've been in the laundry room. You haven't heard that one before? I know. I just made it up. Shall I explain? Our summer has been, or actually the last several years have, if I must admit, an escalation of stresses. Not one thing specifically has thrown us on to the escalator, but a slew of things. Kid things. Adult things. Family things. Medical things. Life things. You have them too. And maybe you handle them differently than we do. But as our escalator was reaching the top (I hope), I realized the place for me to go when the walls were feeling a bit too close for comfort is the laundry room. In the laundry room, everything is predictable. I know there will be a huge pile of towels waiting for me. I know that I will have to pull all the boys' underwear out of their pants while I am sorting the clothes since they remove their pantsandunderwear as a single unit. I know there will be a few items to handwash and I don't mind that. I know that I will wait as long as possible to do any ironing and when I do, it will take forever and I will complain bitterly the whole ironing session. I know that I always bury my face in the first warm towel that comes out of the dryer. In the laundry room, I am an expert. I have the formulas down. Whites in hot. Darks are separate. Red all by itself. And I know how to solve all(most) the problems that crop up in the laundry room. If an errant red sneaks in with the whites, there are two paths to take: bleach or the trash bin. If one of the boys comes home with a mystery stain on a new shirt, I handle that with Oxyclean or a visit to Google. I'm my own little conveyor system: Problem. Solution. Next. In the laundry room, the atmosphere is soothing. It's warm. The ambient white noise lulls. There's a window and a door to the outside world (read backyard) so I can look out if I want to. Or I can just enjoy the light streaming in. I can close the door and keep out any and all unwanted guests. And speaking of guests, no one else wants to visit the laundry room so guests aren't really a problem anyway. So I can be by myself with my blue eucalyptus and lavender scented detergent and dryer sheets, chlorine-free, and biodegradable of course. My pantry and laundry room share the same space. So if the escape to the laundry room isn't enough to shut off the stress valve, there's always chocolate, hidden on the top shelf where only I know. Dark chocolate and a bulky, mindless load of dark towels is just the combination to reenergize me for the next trip up the escalator. So metaphorically, I've been in the laundry room, looking for predictability, focusing on things I am confident of, seeking out a soothing atmosphere, and eating chocolate when all else fails. So far, the laundry therapy is working out well. Our family laundry hasn't looked this good in a long time. Our whites are whiter. The colors are popping. And we appreciate the darks for their role in setting off the bright tones that much more. And I mean this in the most metaphorical way possible. Love the metaphor of the escalator. Great post. as always Courtney, brilliant writing! 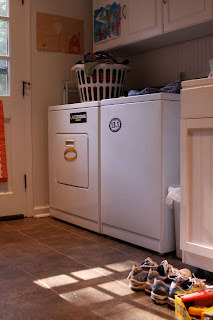 When I first saw the title, I thought, "Laundry therapy? Is she crazy?" I get it, though. However, my idea of ironing is throwing the article of clothing back in the dryer for a quick spin! This is brilliant :) I've never thought of it this way but have an entire laundry room full of dirty clothes right now, so I'll try to see it in a positive light. My friend Molly always said that she loved folding her boys' play clothes; it reminded her how blessed she was to have boys healthy enough to play that hard. Her youngest son died two years ago (age 17), and I'm certain she would give anything to be folding his laundry again. Found you on Saturday Sampling. I'm your newest follower on your super awesome blog! I have a VERY stressful job and I always tell people that I'm going to quit my job and go get a job folding towels. For me, it's doing dishes ... laundry follows a close second. Enjoyed this!